I'm in a Job Search-Now What? explores traditional job searching strategies as well as utilizing social media platforms. Chapter 3: What's Your Google Quotient and Personal Brand? "Differentiation is absolutely essential in today's competitive job market, and Kristen Jacoway's book provides practical strategies for setting yourself apart and attracting the attention of hiring managers. In 'I'm in a Job Search—Now What?? ?,' Jacoway reminds us that career success today requires understanding your personal brand and integrating that brand into everything you do." "We're in the midst of a Social Media Revolution that's changing how we live, do business—and yes, how we look for jobs! If you're a job seeker who knows social media is key to career success, but are reluctant to get started, then this book is for you! By relating her personal experiences and learning, as well as her professional career coaching experience, author Kristen Jacoway guides you with clear instruction, as well as insider tips, on how to take your job search beyond your résumé and job boards! In her book, Kristen starts you off with setting up a career planning roadmap, and then helps you fill in the details with guidance that includes personal branding, online identity, effective use of social media like LinkedIn, Facebook, Twitter, and YouTube—and much more! So, if you want to get started in managing your career online—and you should—let Kristen show you the way!" 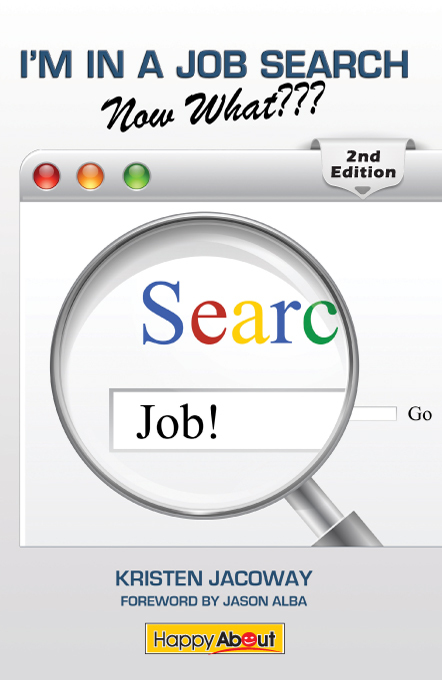 In the 2nd edition of the book, 'I'm in a Job Search--Now What??? (2nd Edition)' you will have a step-by-step guide for the job searching process. The book not only covers job searching strategies, but additionally gives information on how to be in a continuous process of career management. No longer are people climbing ladders in employment. Instead, they are on a ramp and need to constantly make strides to progress and maintain their position. 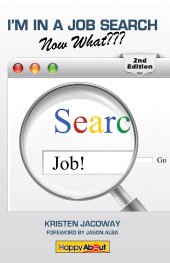 Want a branded edition of I'm in a Job Search-- Now What??? (2nd Edition)? "'...career management is a ramp and not a ladder where you can stop and rest for a bit.' And this is exactly why Kristen's book is such a great read. It fosters the mindset of perpetual motion in proactively managing your career. Created in workbook form so you can make notes, follow the steps, and complete goals, candidates can quickly and effectively launch a balanced search strategy. The SWOT analysis for leveraging company research is well worth the purchase price!" "'I'm in a Job Search—Now What???' is a must for every professional looking to accelerate their job search and generate serious results. Kristen uses engaging exercises to coach you through an otherwise challenging process so you can customize the plan for your unique situation. As a Personal Branding Strategist, Kristen will help you identify a competitive branding message and coach you on the use of social media to connect you with industry experts and targeted employers. Not only will this high-impact duo help deliver immediate results, but these strategies will help you implement long-term career management and resiliency strategies that will benefit your career for years to come." Kristen Jacoway's 'I'm in a Job Search—Now What???' provides a clear step-by-step process for managing your job search. It not only provides great information about clarifying your personal brand, your online identity, your career marketing materials, social media and online networking, but also includes exercises to help you start applying the learning and taking action right away. A great book for the job seeker looking to embrace the power of the online world to accelerate their job search." "Looking for a job? In transition? If you need a fast, easy-to-read, informative guide to achieve your career search goals, Kristen Jacoway's 'I'm in a Job Search—Now What???' is a great place to start. Information-packed with plenty of exercises to jumpstart your job search, it serves as a valuable reference guide—both for those just starting out and for seasoned careerists. With its overview of personal branding, social media, and job search strategies and resources, it can serve as your central hub for planning and executing a search that works for you. If time is of the essence, read this must-have career book now!" Kristen Jacoway is a writer for Younique (a global newsletter reaching 50,000+ subscribers), and her work as a contributing writer is featured in Cover Letters for Dummies 3rd Edition, by Joyce Lain Kennedy (Wiley Publishing, January 2009), as well as Personal Branding for Dummies by Susan Chritton (Wiley Publishing, June 2012). She has been quoted in a press release and interviewed for an article for TheLadders.com and has been quoted in articles for Monster.com, Aol, and many more. She additionally writes for the Atlantic City Weekly. Career Rocketeer named her as one of the 150+ Experts on Twitter that All Job Seekers Must Follow.